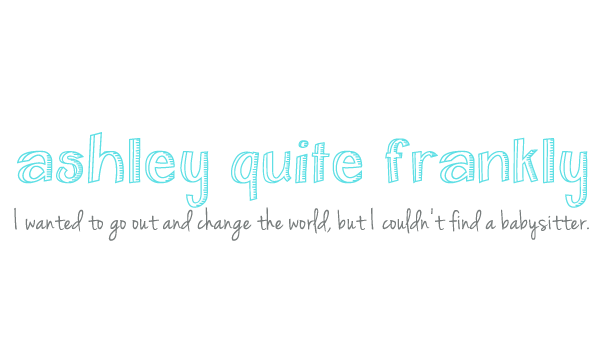 Ashley Quite Frankly: Yeah baby! little kid is just getting progressively funnier. He cracks me up on a daily basis. His new catch phrase is, "Yeah baby!" in a very Austin Powers-esque fashion. He says it all the time. Today we were discussing whether we should do the beach or an art show and he yelled out,"Da beach. Yeah baby!" If you ask him if he wants to get some lunch, "Yeah baby!" If you ask him if he wants to watch a movie, "Yeah baby!" I have no idea where he heard this, but it is so perfect for him. His other latest obsession is his "cow rope" (pronounced t-ow rope), the leather riding reins my mom gave him for his spring horse that he uses as a lasso. He takes it to day care and must know where it is at all times or he'll follow me around asking, "Mumum, where mah tow rope? I neeeeeed it, mumum" until I break down and go find it. We've had to implement strict rules against roping Big Kid or the pets because he had most of the household living in fear. Now he lines up his Radio Flyer spring horse, his rocking horse and an assortment of stuffed horses and cows and practices lassoing them and dragging them around the room triumphantly. He recently saw an amateur rodeo at the fair and it obviously made an impact. He is constantly wearing his cowboy boots, hat and chaps and saying "he cowboy". Oddly enough, he also still insists that he's a baby and uses this as an excuse for everything. If I tell him his hair looks crazy, "Is baby hair, mumum", if I tell him he's naughty, "I just baby, mumum". Tonight he was trying to avoid bed time by telling Mr. Ashley, "I need be mumum's baby", meaning he wanted to lie in my arms and stare at each other (he makes sure we do this at least daily, it is a little strange but also very sweet). Tonight he kept craning his neck around so he could see the television and Cops was on. I told him Cops wasn't an appropriate show for him and he said, "I like Tops, mumum. Is okay for baby." I sent him to bed because I highly doubt Cops is okay for a baby, especially this particular baby. I don't really need him imitating cops or bad guys, thanks. Living with a two year old baby cowboy is enough excitement. So cute! Trevor insists he is "not my baby" anymore. LOVE this! I imagine this is how the Bud is going to be... but angrier. He seems to have quite the temper. I love that he is roping everything. I bet you hope he grows out of that phase before he learns about bullriding. Too cute!! does he have a cowboy hat?? They are so funny at this age! It will be weird if he starts to say "do I make you horny baby, do I?" I hear that one from DH every.single.day. That's sweet that he still wants to be your baby. Katie is very insistent that she is NOT a baby any more - she's a BIG GIRL. She even yelled at me for buying a package of diapers (to start stocking up for the new baby) because she thought I was buying them for her. She said, "No, I don't need diapers anymore! I'm a big girl!"